The Park Board Commission meets on the second Wednesday of each month at 6:00 p.m. in the Castle Rock Senior Center. Public comments are always welcome. Meeting agendas and minutes are available below. 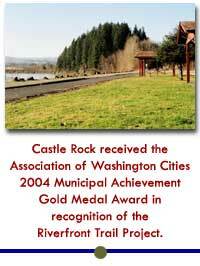 The City of Castle Rock received the Association of Washington Cities 2004 Municipal Achievement Gold Medal Award in recognition of the Riverfront Trail Project. Memory Lane Volunteer Park – located at the end of Michner Street, near the Riverfront Trail. includes playground equipment, covered picnic area and a area to plant trees in memory of a loved one. Coldwater Park – located behind City Hall building – playground equipment, picnic table. Lion’s Pride Park – located 1400 block of Huntington Avenue South. Serves as the trailhead to the Riverfront Trail. Amenities include covered picnic areas including small barbecue units, restroom facility, and RV dump station. Riverfront Trail – Trailhead is located at Lions Pride Park, however there are several other barrier free access points. Trail amenities include viewing areas, benches, picnic tables, ADA accessible. Trail areas are located on both sides of the Cowlitz River. On the east side of the river is a 1.5 mile lighted, paved multi-use trail extending from Lion’s Pride Park north to just past the PH10 bridge. 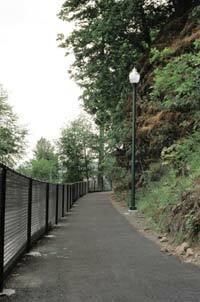 On the west side of the Cowlitz River the trail is constructed of compacted gravel, from the PH10 bridge to the mouth of Whittle Creek and a 1100’ paved path from PH10 bridge to the Castle Rock Sports Complex. The City of Castle Rock received the Association of Washington Cities 2004 Municipal Achievement Gold Medal Award in recognition of the Riverfront Trail Project. The Rock Community Park – located at intersection of Front Avenue SW/Huntington Avenue South, just off of the Riverfront Trail. This is a large rocky outcropping which is the city’s namesake. A historic marker is located at the foot of the rock. Includes hiking trails and picnic tables. Bountiful ecosystem including native trees and vegetation. Not handicapped accessible. Skate Park – limited to skateboard and roller blade users. Located near the west end of Third Avenue SW, off of the Riverfront Trail. BMX Park – limited to bicycles and trail bicycles. Located at the west end of Warren Street SW, off of the Riverfront Trail. Lions Memorial Park – located at the intersection of Front Avenue NW/Huntington Avenue North.